Make your wedding day stress free. 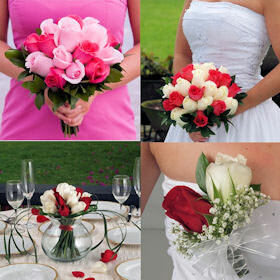 Choose all of your special day flowers in three simple steps. 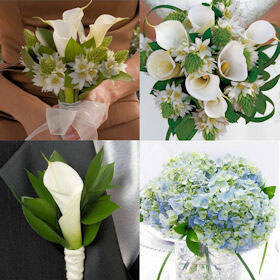 Our Ready, Set, YES I Do wedding combos includes one Bridal bouquet, a set number of bridesmaid bouquets and centerpieces plus a set number of boutonnieres & corsages. The collections also come with a few rose heads for petals. All instructions are included. No vases are included. We have three wedding combos: 10, 20 and 40 wedding pieces. 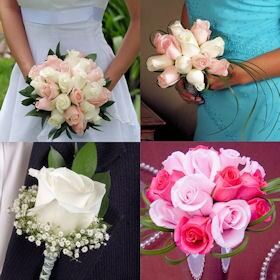 All your floret needs for your wedding, completely assembled and ready for your special day. They are shipped directly to you in a specially designed box. The way we pack and ship all our flowers will guarantee your 100% satisfaction or your money back.